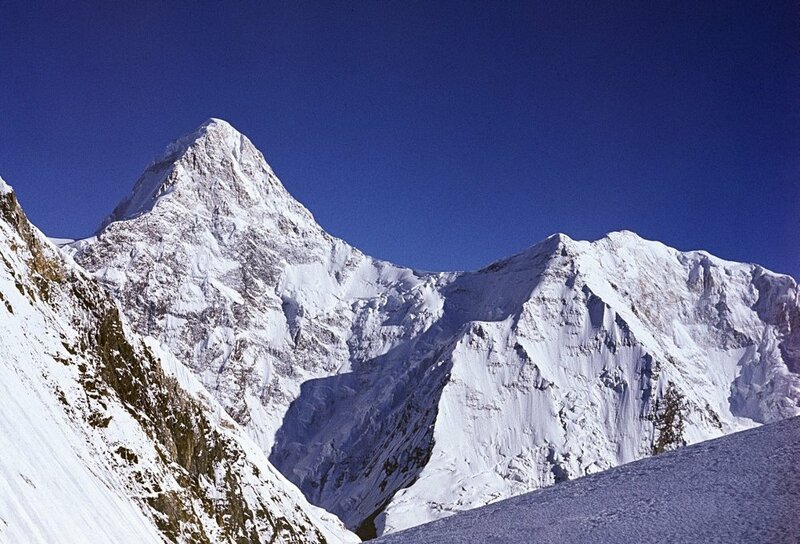 Khan Tengri Peak, rising 7010 m (22,999 ft) above sea level, is located on the border between Kazakhstan and Kyrgyzstan. 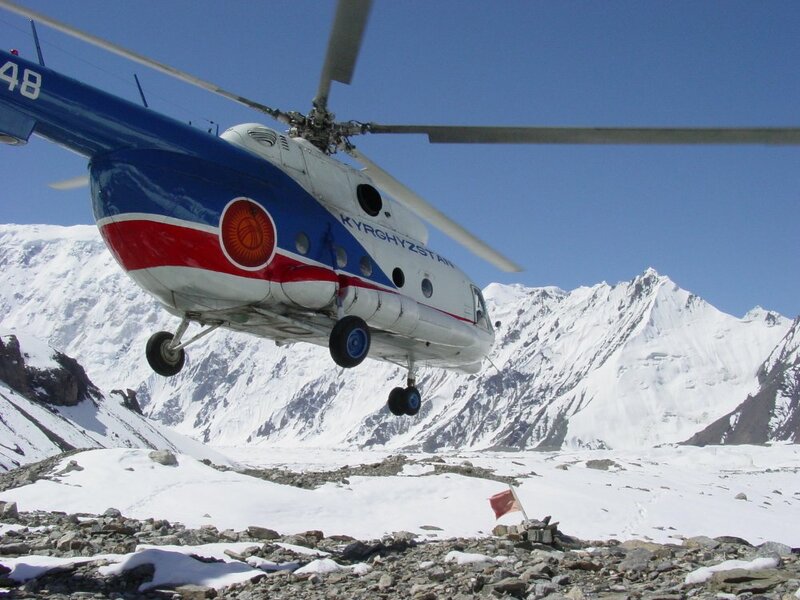 The beauty of Khan Tengri is often hard to describe, but must be seen firsthand. The first description was given in by famous traveler and photographer P.P. Semenov from the headwaters of the Karkara River while traveling the Tian Shan Mountains. 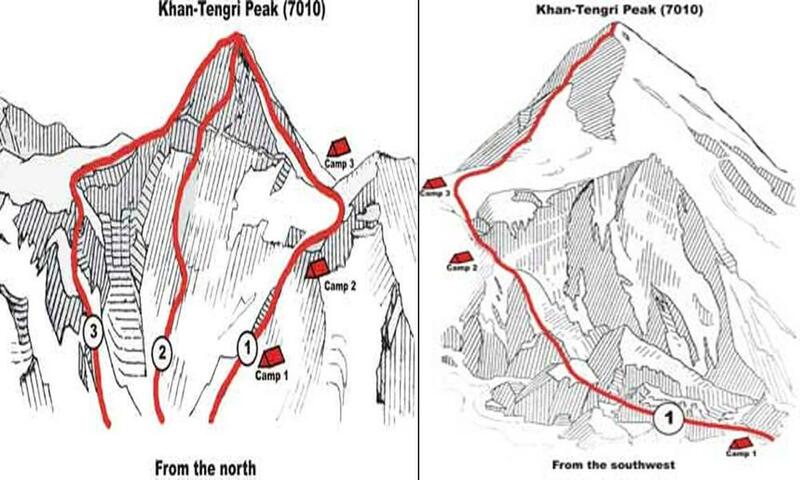 Khan Tengri’s name means “Lord of the Spirits” or “Lord of the Heavens”. 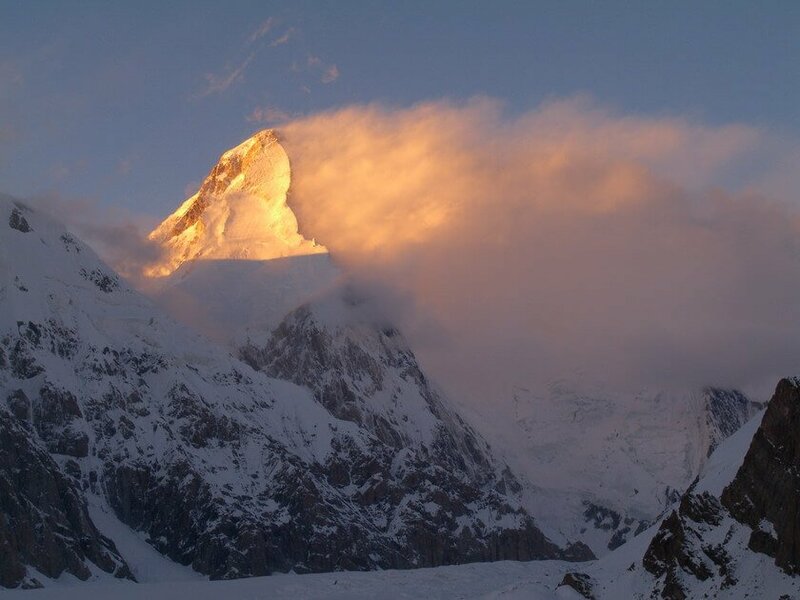 The peak is extremely beautiful during sunset as surrounding peaks start dipping into darkness, the marble-pyramid shape of Khan Tengri Peak is painted bright red from the setting sun. The enchanting ridge lines and rose-gray marble facade has attracted the attention of people for centuries. 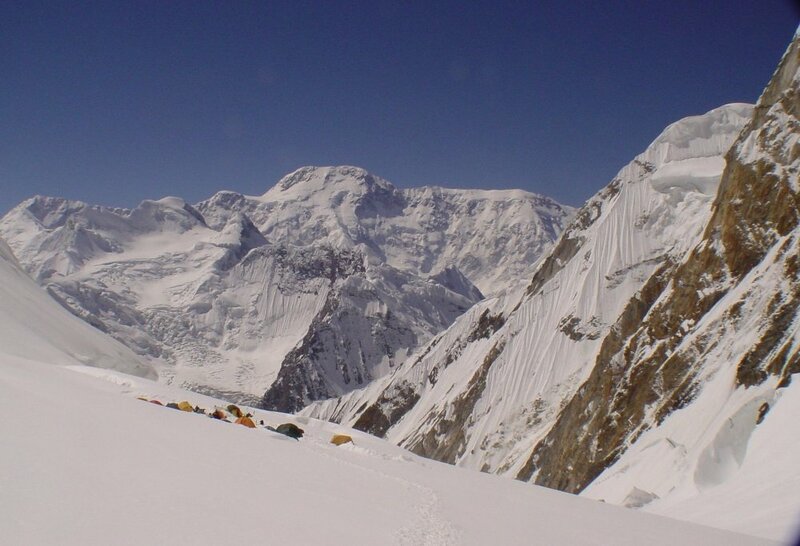 Every year the peak attracts many climbers from all over the world. One of the classical routes we offer is by starting the ascent from the south; the Western Col is reached from the southern Inylchek Glacier. 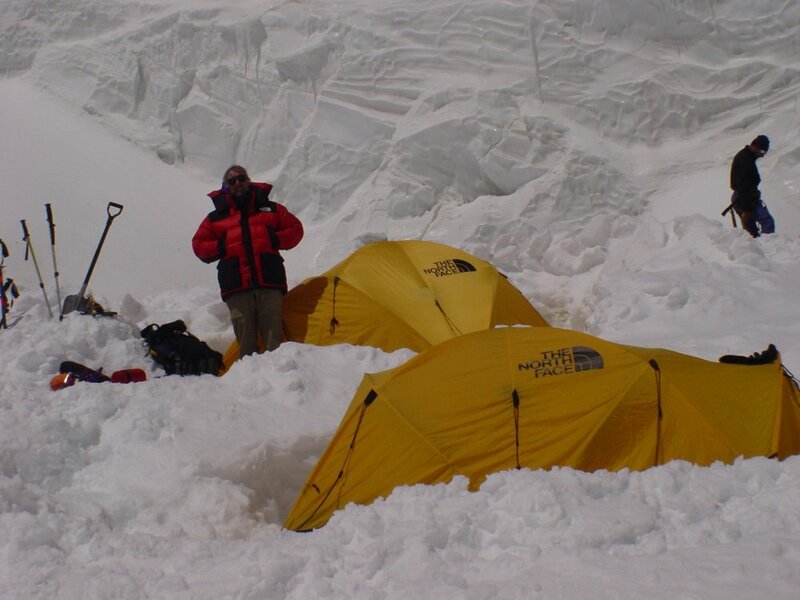 Among mountaineers, this route is very popular with three or four camps typically used depending on weather conditions. 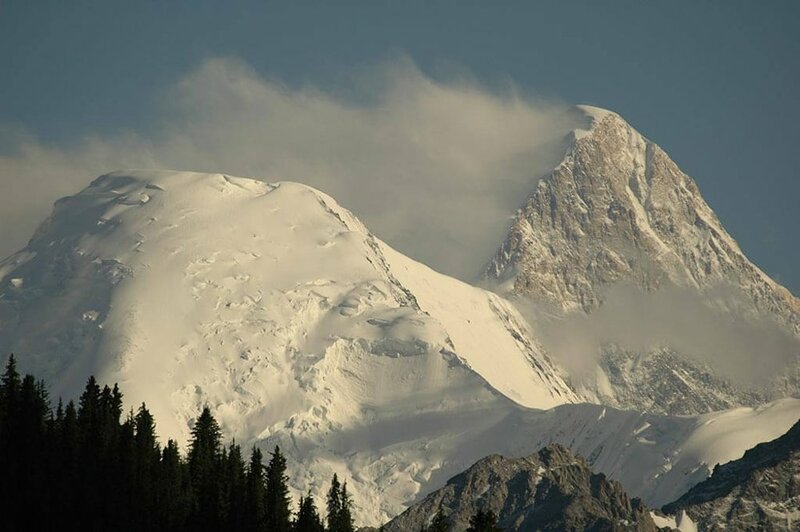 The West Ridge for Khan Tengri climbing is a classic route that presents a reasonable objective for competent mountaineers. The ridge rises from the West Col, which is very enjoyable, straightforward ‘scrambling’ for the most part, with steep rocky steps linked with snow patches. There are only a couple of sections which require more care; such as the vertical rock step of about 50 ft at 6,800 m ( ft) and the knife above. 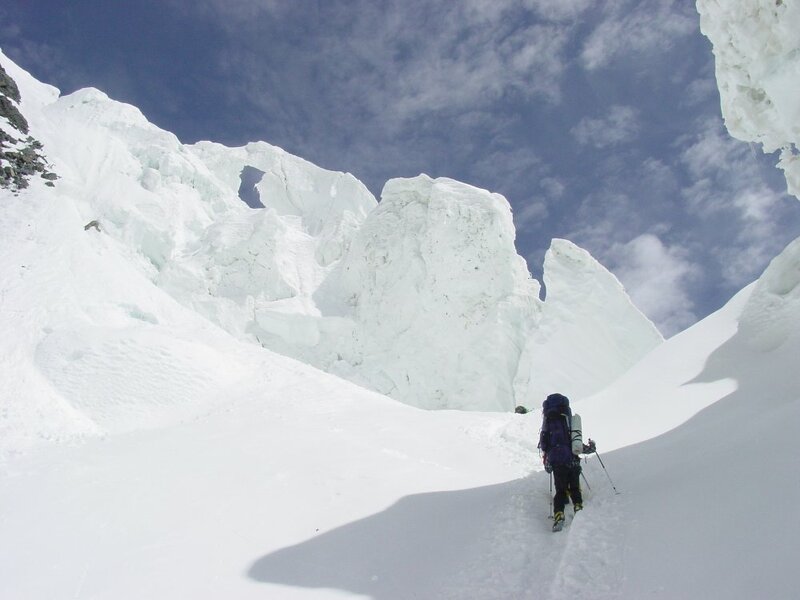 In terms of equipment needed once on the route, a single ice axe is sufficient, although the addition of a ski pole might be useful. From the snow caves (near the West Col) a short snow/ice slope of 40°, which is fixed with rope, leads up to the West Col at 6000m (22,310 ft). 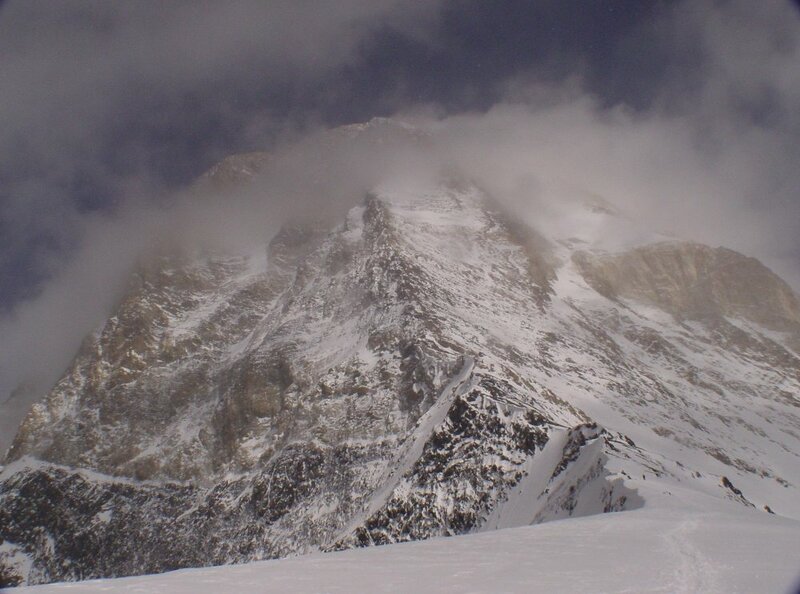 The Col is narrow and heavily corniced and the top of the fixed ropes should be carefully noted. 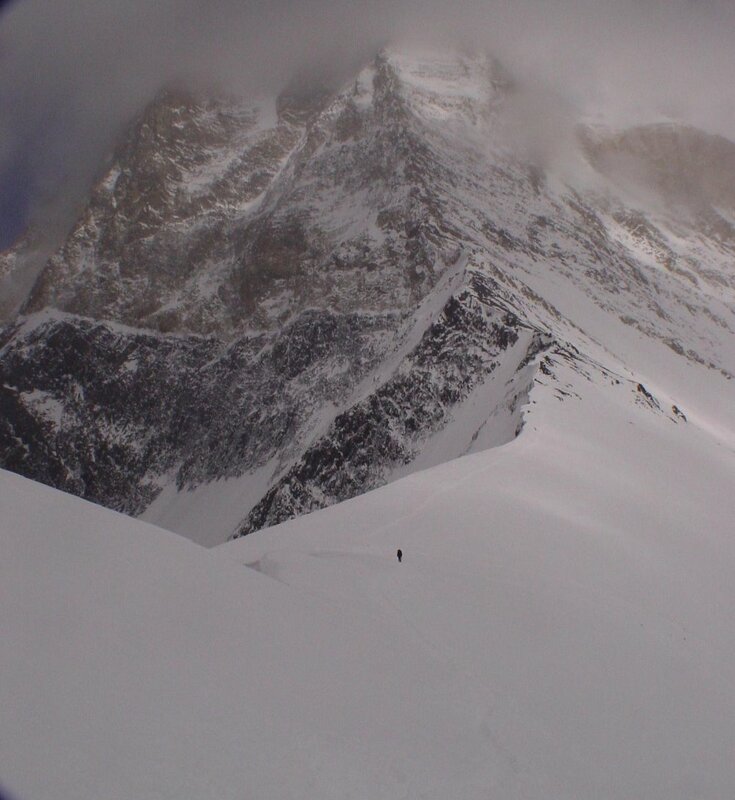 A traverse along the Col leads to the mixed ground of the West Ridge where the angle steepness. 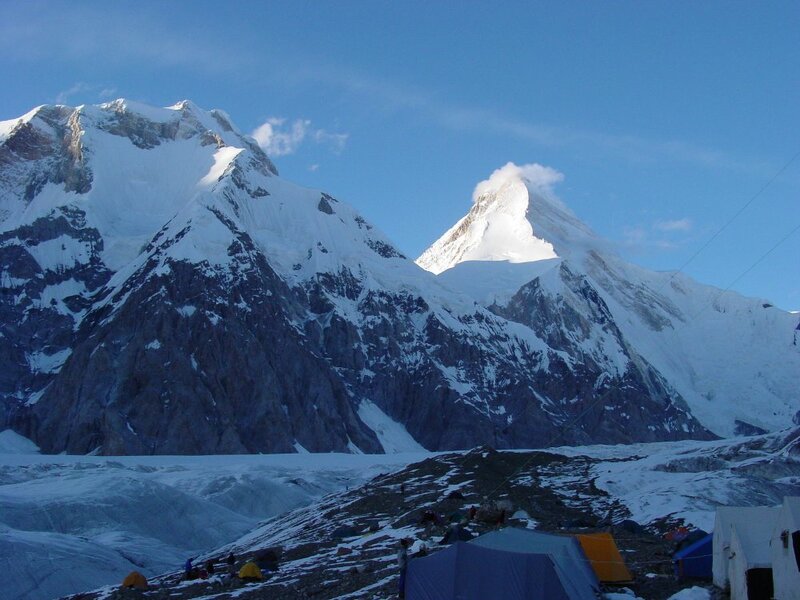 The route then follows the West Ridge via a number of small bivouac sites at 6200 m (20,341 ft), 6400 m (20,998 ft) and 6700 m (21,982 ft). 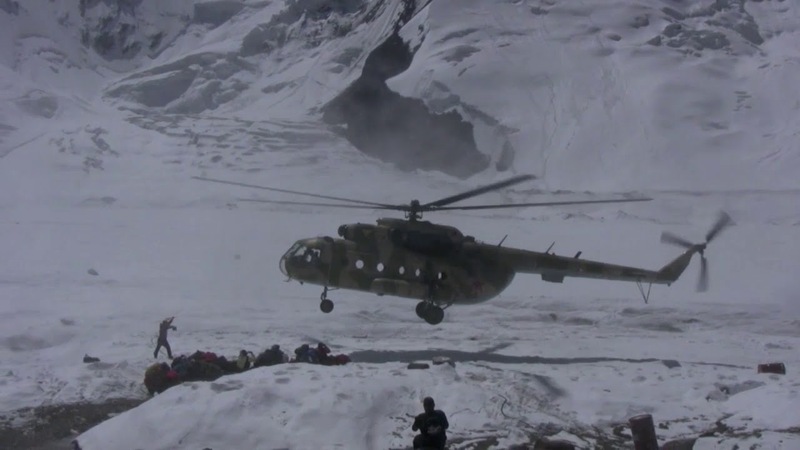 Almost the entire ridge is fixed with rope, but these need to be used with caution as their condition and the anchors are variable (the ropes are renewed at the beginning of every summer season by local guides). 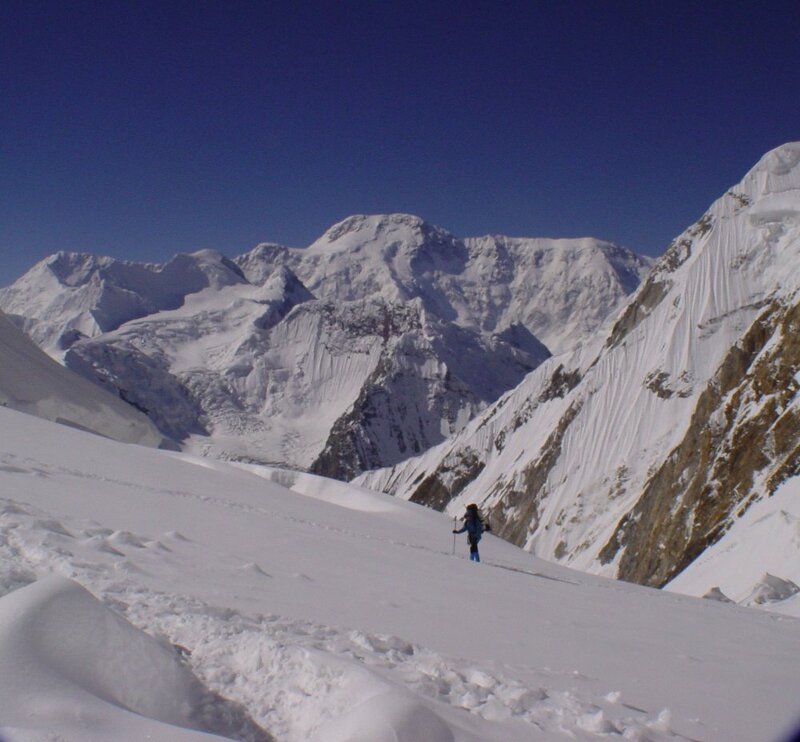 The route follows the crest of the ridge with snow and scrambling interspersed with steeper rock sections until 6,700 m (21,982 ft). 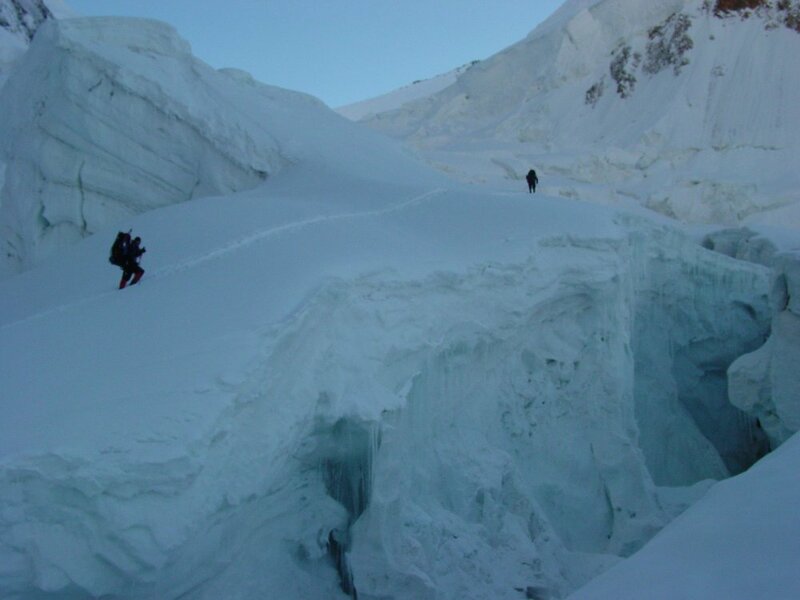 Here a traverse rightwards across snow slopes reaches a steep rock step of some 20 m (66 ft) which is severe in standard. Above this the route climbs into a snow basin and then traverses out rightwards again to exit onto a short steep knife edged snow ridge of some 50 m (164 ft) which is very exposed. This is followed leftwards to a steeper section of mixed ground. 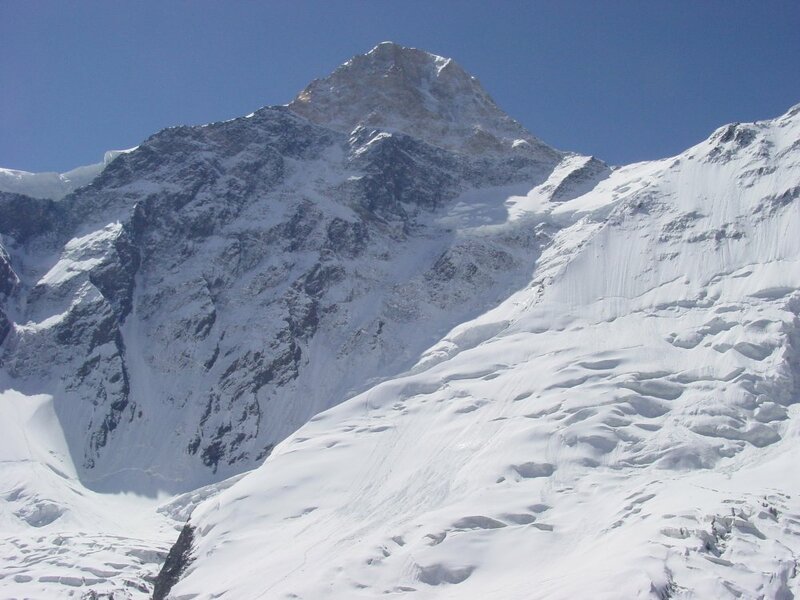 Above this, the fixed rope ends and there remains around 300 m (984 ft) of easy snow climbing for half an hour to reach the summit. 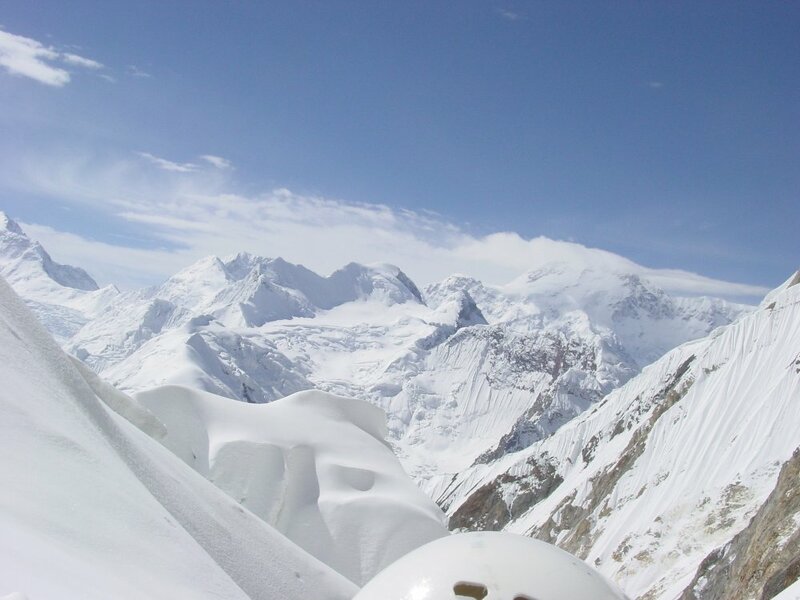 The true summit is rather difficult to find, being a large flat snow dome, so the summit point is marked by a metal tripod.